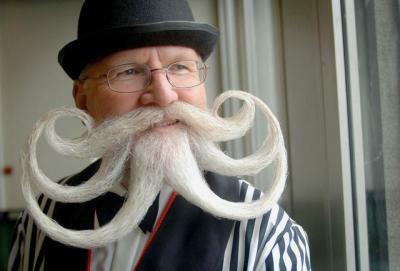 Max & Erma's will celebrate the joys of beards and moustaches in a competition to see who has the most fantastic facial hair in the Erie area. Facial hair is wonderful. Not only are beards and mustaches great for deflecting cold wind and can make men look ruggedly handsome, but they also have some health benefits, including helping with allergies and lowering a person's risk for skin cancer. It's not all fun and manes, however, as facial hair requires time, dedication, and proper grooming tactics. Beards need to be developed from follicular infancy, growing through the awkward itchy stage before blooming into a lucious creation. That requires work, and that work should be rewarded, so the good folks at Max & Erma's are ready to help. The Interchange Road eatery will host its Fourth Annual Beard and Moustache Competition Friday, Nov. 21, an event that will showcase some of the finest facial hair in the Erie area. Signups for the competition will start at 9 p.m., so if you think you have a beard and/or mustache that can go hair-to-hair with anyone around, then make your way to glory at Max & Erma's. I know what you're thinking: "Shoudln't I get rewarded if I'm a gifted beardsman?" Why yes, you should. Prizes including treats from Max & Erma's, Harley Davidson, and some local breweries will be given out to the winners of three separate categories: best beard, best mustache, and most creative facial hair. In addition to those three fields, Max & Erma's will also name some surprise awards, so you never know just what titles will be awarded on the night. In addition to the competition, the event will feature beer samples from Nourth Country Brewing Company, Erie Brewing Comapny, and Lavery Brewing Company, because beards and brews pair oh, so well. Happi 92.7 will also be on hand for a live remote, and music will be provided by a live DJ. Even more, you can simply bask in the glory of guest emcee Joe the Beard's wonderful facial gifts if you want. Competing or no, head down to Max & Erma's for the Fourth Annual Beard and Moustache Competetion and celebrate some awesome facial hair.